We’d love your help. Let us know what’s wrong with this preview of How to Protect (Or Destroy) Your Reputation Online by John P. David. With virtually nonexistent oversight, the Internet can easily become the judge, jury, and executioner for anyone s reputation. Digital attacks and misinformation can cost you a job, a promotion, your marriage, even your business. Whether you ve done something foolish yourself, are unfairly linked to another's misdeeds, or are simply the innocent victim of a third-party att With virtually nonexistent oversight, the Internet can easily become the judge, jury, and executioner for anyone s reputation. Digital attacks and misinformation can cost you a job, a promotion, your marriage, even your business. Whether you ve done something foolish yourself, are unfairly linked to another's misdeeds, or are simply the innocent victim of a third-party attack, most of us have no idea how to protect our online reputations. To ask other readers questions about How to Protect (Or Destroy) Your Reputation Online, please sign up. CEO Blog, Capture Profile (Twitter, Wikipedia, Facebook, Webpage), Pirate’s Code (Deep Web). Everyone needs to read this book as we are all online! Author John P. David writes, "The internet's blessings are bittersweet." People are leaving their digital online lives open to the general public AND John David explains how to protect yourself through various examples and advice! After reading "How to Protect (Or Destroy) Your Reputation Online," I know that I am thinking twice! 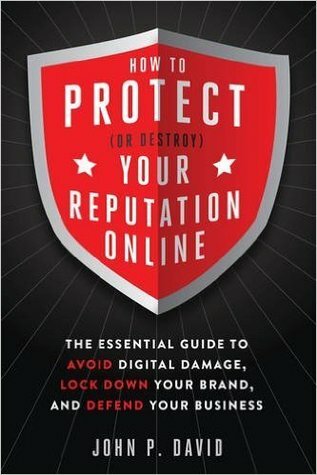 How to Protect (or Destroy) Your Reputation Online: The Essential Guide to Avoid Digital Damage, Lock Down Your B Everyone needs to read this book as we are all online! Author John P. David writes, "The internet's blessings are bittersweet." People are leaving their digital online lives open to the general public AND John David explains how to protect yourself through various examples and advice! After reading "How to Protect (Or Destroy) Your Reputation Online," I know that I am thinking twice!